One of my giant pumpkins in 2011. Wasn’t she beautiful? I am trying to grow giant pumpkins again this year and haven’t talked much about them as I have not had good luck growing them the last 3 years. I broke the NM State Record for giant pumpkin in 2010 and broke my record in 2011 and then my record was broken in 2012 by someone else. Since then, nobody has set any records here for New Mexico as far as I know. It is not as easy as I first thought. I must have had beginner’s luck. If you can get one to take and keep growing, nothing is more beautiful in the garden than seeing these huge orange globes in a sea of green leaves! This year, I bought some seeds from the world record holder 0ver 2300 lb and both of them never germinated. Arrgh! So now I’m down to 2 pumpkin plants that came from a 2009 lb pumpkin and 1 pumpkin plant from an 1879 lb pumpkin and 1 pumpkin plant from an 1135 lb pumpkin. 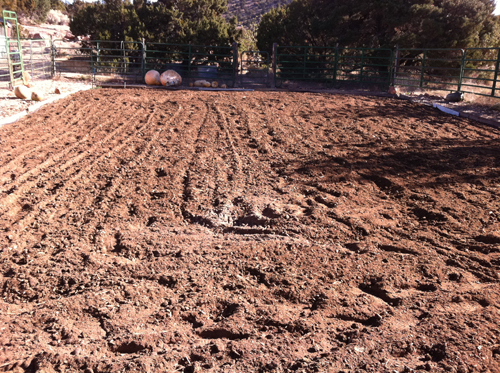 The 1135 pumpkin plant had some animal dig by it and it got buried for a while but might come back. Actually doesn’t look too bad but should be growing a little faster-it might have been set back from the incident. That’s why I grow more than one-sh*t happens. And the last 3 years, it’s happened a lot regarding giant pumpkins. So far, one of the 2009 (grower-Langevin) pumpkin plants looks very good, growing nicely, the other one is a little slower but still good and the 1873 (grower-Steil) plant is looking pretty good too. A glimmer of hope! I fertilized all of them on Monday with a cocktail that had fish fertilizer, mycorrhizal, Azos, kelp emulsion and 2 fungicides-Rootshield Plus and Companion. I give them some fungicides because I’ve had some die from some fungal wilt before so I’m trying to be preventative. I always say I’m giving them some juice which really is a cocktail of a mix of things all at once and all must be compatible. All giant pumpkins are BIG EATERS so fertilize them 1x a week with at the least fish/seaweed fertilizer. My first year I only did that and got some 200-300 lbers. This is not like the ‘Biggest Losers’ show where you starve the pumpkins in our lousy soil but more like the ‘Biggest Winners’ by feeding them a lot and giving them a lot of water too. 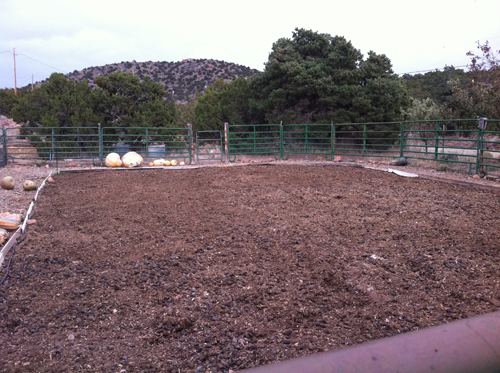 You don’t get to be 500-1000 lb+ in 4 months without feeding them every week. Barry Todd’s pumpkin, 556 Todd second from left. Photo taken May 6. Today I planted the 3rd and final giant pumpkin plant that has been growing steadily in the greenhouse. A pumpkin friend, Barry Todd, from Colorado gave me some pumpkin seeds a few years ago and I planted one of his last year and it was doing great when a rabbit or squirrel ate it down to the ground. So this year I wanted to plant another one of his seeds especially when I heard he was ill. He has been battling leukemia and is pretty sick but fighting on. This seed I planted is a cross between Cristy Harps’ 1725 giant pumpkin that broke the World Record in 2009 and another pumpkin Barry grew out a few years back that he is quite fond of-the Todd 50. It is the 556 Todd. I was going to grow a giant bushel gourd where the pumpkin will go but I bumped the gourd to squeeze in Barry’s plant. I’m not sure if Barry is planting any pumpkins this year. I met Barry a few years ago at the Old Colorado City Giant Pumpkin weigh-off and he was so nice to me and offered some pumpkin seeds for the following year. 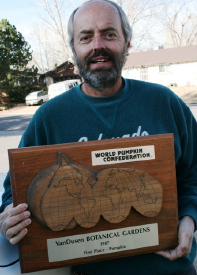 He was the Colorado State Champion for giant pumpkins with a 1308 lb pumpkin in 2010.We have been in touch since then regarding pumpkin growing and he has given me some great tips on how he grows em. I consider him one of my pumpkin mentors. I don’t know much about Barry except he is passionate about his pumpkin growing and his religion and I think it’s his faith that keeps him going. I wish you a full recovery Barry and hope this little plant breaks the NM state record. No matter what it does, I’m growing it in honor of you. I still have one more plant in case one of the others get eaten or dies. My giant pumpkins are in! Last week I managed to get them in the ground. They are being shaded from our intense heat and wind right now in these new low tunnels or ‘giant pumpkin hotels’ as I prefer to call them. This is the newest rendition of the low tunnels for them and I’ve had many designs. All I did is take one of my tomato cages which is made of concrete reinforcement wire and opened it up and put shade cloth over it (while they acclimate). I attached the shade cloth with clothes line pins and held the ends down with rocks. They are staked in the ground so the wind does not pull them up and inside each one is a pumpkin that is also covered with light weight row cover in case a squirrel comes in. As soon as they outgrow the ‘hotel’, I will take them off. 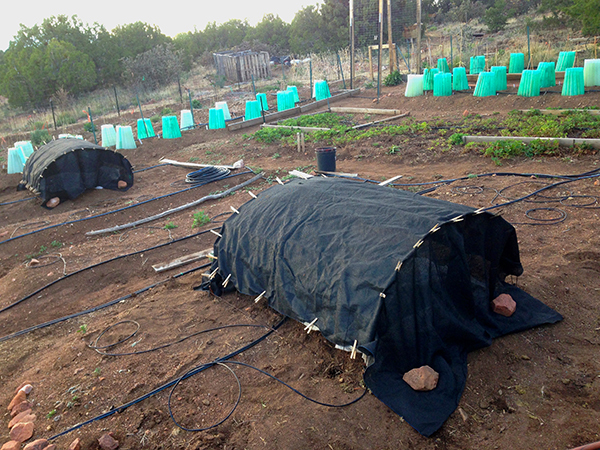 They are about 5′ wide by 6′ long and if needed I can put row cover over the cage replacing the shade cloth for more light. In the background is a strawberry patch I’m revamping but decided to wait before transplanting the ones growing out of their raised bed because they are June bearing strawberries so I want to harvest first. Then afterwards I will complete the move. Also shown are some of my tomatoes in their wall of waters. Some of them are now outgrowing the wall of waters so I am starting to take those off. It is always amazing to me how desolate the garden looks when I first plant and how lush it will be later. Nature’s miracle…oh ya and a LOT of HARD WORK! The first number is how many lbs the pumpkin parent was, the next is the name of the grower, then the date it was grown, after that is it’s genealogy below it (it’s grandparents). It’s important to see who they were because they could have been bigger than the plant the seed came from. The genealogy can go back several generations further. Here is the germination pics. They were planted on April 14th. Here is my germination process: You need to start them inside the house where it is WARM. An unheated greenhouse or hoophouse will not work very well. 1. I first filed the edges lightly avoiding the tip until I see a little color change on the edge. Do not file too much. 2. I then soaked them for 12 hours in warm water with a few drops of seaweed emulsion. 3. I take a 4 or 5 inch peat pot and cut it in half on the sides only (not the bottom of it) and re-tape it so I can remove the plant more easily later if I need to plant up or if I can plant outside. 4. I planted them into 5 inch peat pots this year (I got the 5 inchers from Lowes here in town) with a good seed starting mix. (Some people put them on damp paper towels in plastic bags on heat mats until the root germinates but I prefer to direct seed them in the pots. 4. I then put them on a seed heating mat and cranked up the heat to 90-95°F. This is important as giant pumpkin seeds germinate faster when the heat is this high. So move other plants off this mat if they can’t handle the heat. If you don’t have a thermostat on your heating mat, you will need one to control the temperature. 5. Check them twice a day and keep moist until they germinate. Sometimes one of the first leaves that germinate (called cotyledon leaves) will push up with the seed shell still attached as in the picture above. I waited a day and gently pulled it off without damaging the leaf. 6. Once they germinate, you can turn down the heat to about 80° F. They like heat-no they love heat. 7 . I water with a weak solution of seaweed, fish emulsion and microbe brew from Fox Farms (it has mycorrhizal in it to help produce more roots) every week in between their normal watering. Giant pumpkin seeds planted inside-It has begun! Three of these seeds are from Colorado and one seed from Wyoming. So let me explain what each name means for those of you interested in giant pumpkin growing as each seed name gives important information. Let’s take the 895 Grande 08. This seed came from an 895 LB pumpkin and the grower’s last name is Grande and was grown in 2008. The rest of the information is the genealogy of the 895 Grande that I’ve provided. So 1016 Daletas was the mother plant and was a 1016 LB pumpkin and the grower was Daletas and no year given. 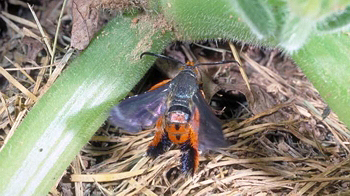 The father plant (pollinator) was 1385 Jutras. So this pumpkin weighed 1385 LBS and the grower was Jutras with no year given.The reason you should go back and look at the parents is you can see that the 895 came from some huge pumpkins. 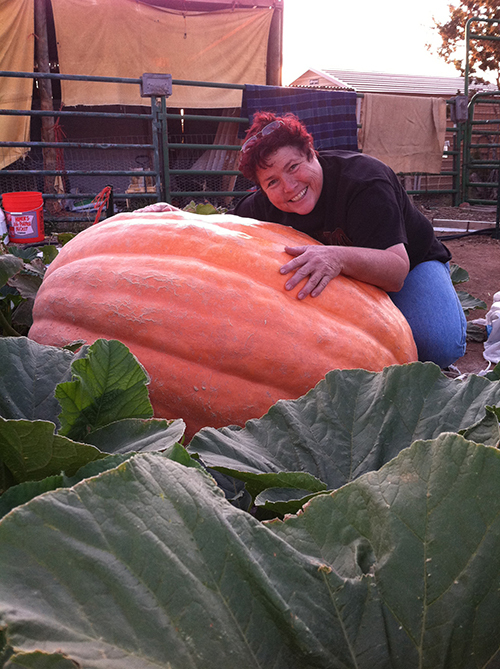 The 895 Grande produced my NM Giant Pumpkin State Record of 448 LBS back in 2011. Last year I grew the 448 Cabossel 11 (nicknamed MAX) but didn’t break my previous record so I’m going back to the parent 895 Grande to try again. My record gotten broken last year. The current record is 530 LBS so I’ll try to regain the State Record this year! Notice I’m also growing seeds from much bigger pumpkins as well but with our short growing it is very hard as I lose about a month of time other growers get. Wish me luck! I just posted about the squash vine borer and a gardening friend, Gene, mentioned that his squash is smaller than in the video in a comment in the earlier post on squash vine borers. I forgot to mention that while the squash is small before they blossom, I keep them covered with row cover which keeps both the SVB and the squash bugs out but once the plants are bigger and blossoms, we have to take the row cover off for the bees to be able to pollinate them-that’s when we should use the foil. I’ve been really busy this fall around the garden since the Pumpkin Bash. It seems like I never have time to do any projects when the garden is going so I try and get some of the projects done in the fall before the dead of winter. Last week cleaned out the pumpkin patch and then I rented that Bobcat where I spread out about 4 yards of horse manure on top of it. I really needed to dig it in or it would blow away before spring. 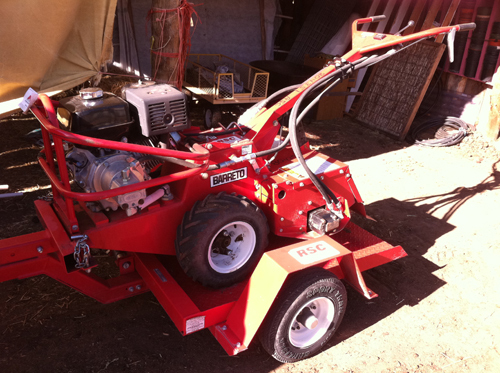 So yesterday I rented a giant rototiller (16 hp) and plowed in the 4 yards of manure, 50 lbs dried molasses (it smells so sweet), 50 lbs mushroom compost (are we cooking here? ), and 50 lbs of gypsum (for calcium-makes strong bones, I mean strong plants!) in the pumpkin patch. Now it looks so beautiful and is ALMOST ready for next spring! I still have to dig in some leaves (in the holes where I will be planting the pumpkin plants next spring) and a little (I mean very little) composted chicken manure to start the decomposition process so they can decompose over the winter and become leaf mold or should I say leaf gold by spring. This will be the third year for this pumpkin patch and boy what a difference three years makes when you add amendments each year. It’s starting to look good and the rototiller just cut through it fluffing it up together. I don’t like to rototill very much because of how hard it is on the soil microbes but felt that I needed to do it for now since this dirt was so void of any organic material and hard as a rock. I think after this year I’ll won’t have to do it again. I will add more mychorrizial next spring to help replenish the soil microbes.